Can't make it to the auction? No problem. Catch all the action online as it's happening live, through real-time audio and visual feeds with Auction Edge Simulcast Technology. New to Capital City Auto Auction? 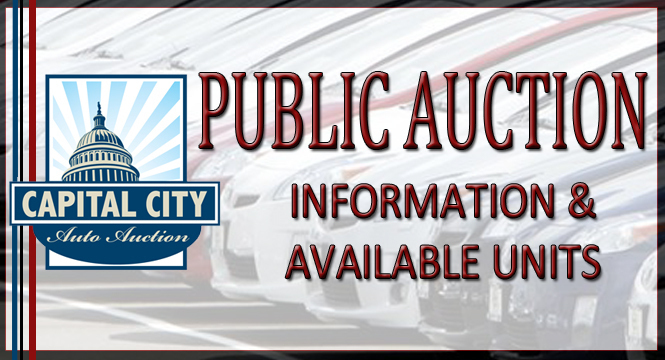 Register Now to view run list and access Capital City Auto Auction Simulcast. Already a registered user? 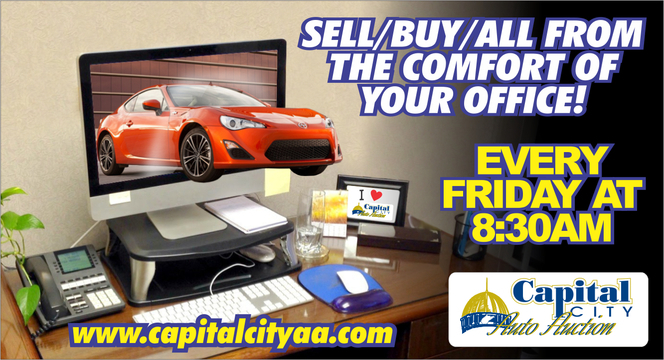 Log in to Capital City Auto Auction Simulcast. Any public individual can attend the public auction free of charge, as long as the individual will not be a participant bidder and not issued a bidder badge. Individuals must check in at the front desk and receive a visitor badge. All bidders are required to register and must be 18 years of age to do so. In order to register, all bidders must show a valid Drivers License or State picture ID There is no admittance fee. However, there is a $500.00 deposit that will be returned if the bidder does not purchase a vehicle. If you are the successful bidder on a vehicle, your $500.00 registration fee will be applied toward the total cost of the purchased vehicle. Your registration fee will be forfeited if you fail to pay the balance due or if you do not proceed with the sale. Vehicles must be paid for and picked up by 5:00 PM close of business Friday. If payment not received in full, CCAA reserves the right to re-sell any vehicle after Friday, and you will automatically lose your deposit. All deposits receipts must be turned in by the Close of business day Friday after the sale or you will lose your deposit. Capital City Auto Auction reserves the right to void any transaction. CARS ARE LEFT ON THE AUCTION PREMISES AT OWNER'S REQUEST AND RISK. The auction shall not be held responsible for loss or damage, even though the keys and car may be placed in the auction's custody for services which are made available to customers on these terms. No one will be permitted to remove a vehicle until the vehicle is paid for and the auction is over. Any vehicle left in our lot after Close of Business Friday will be charged $20.00 per day storage fee. Anyone caught removing any item from a vehicle will be asked to leave without a refund of your deposit and will be banned from all future auctions. If the successful bidder does not pay for the vehicle they will lose the deposit, be banned from all future auctions and be turned over to a collection agency. Additional Charges: There is an additional $55.00 Documentation Fee added to the final sale price of your vehicle. Vehicles will be removed from CCAA's property before any repairs are made. CCAA has towing available. Call (304) 201-2270 for towing and rates. All vehicles will be sold as is. "No Refunds" CCAA's is not responsible for the year, make, model or mileage. Paperwork will only be put in the name of the registered buyer, absolutely no exceptions. When calling about titles, you must have auction-letter and number ready (example: D-57). When picking up titles, you must have the bill of sale with you, no exceptions. Arbitration Policy: All vehicles sold to the general public will be sold "RED LIGHT ONLY". RED LIGHT – "AS IS"
This light is used to sell all "as Is" units which means these units cannot be rejected for any reason. EXCEPTION: (if not announced: R-title, previous salvage history). RECONSTRUCTED VEHICLES: Selling dealer is responsible for announcing if the title is or ever has been a Reconstructed or Salvage Title, regardless of color of light it is running under – illustrated by a "yellow announced condition light." Any problems arising from these conditions must be reported to the Auction within thirty (30) calendar days – NO EXCEPTIONS! Any vehicle sold for $2,000.00 or less is an “As-Is” vehicle regardless of what light it was run under. Odometer Policy: CCAA is not responsible for nor does CCAA guarantee the accuracy of the odometer reading on any consigned vehicle. However, CCAA requires that the seller repurchase any vehicles sold with an odometer problem. OFFICE HOURS – Monday thru Thursday, 9:00 a.m. – 5:00 p.m., Friday 8:00 a.m. – 5:00 p.m. Friday Auction starts at 8:30 a.m.
Form of Payment: Cash, Cashiers check or wire transfer. Checks will be accepted with a 30 day letter of guarantees from your bank stating amount and date good for. Example: Said bank guarantee check number 123 in the amount of $ 10,000 for 30 days written to Capital City Auto Auction Inc.
All purchases will be subject to a 10% percent buyer’s fee or a minimum of $195.00. On-Line bidding is available. Please call for 304.201.2270 (Ext. 337) for more information. Must be 18 years old to enter the bidding arena no exceptions. Selling accounts may offer some units to Dealers Only - see comments on individual units to determine if unit of interest is available to Public. * THERE WILL BE A $20.00 PER DAY STORAGE FEE CHARGED FOR EACH VEHICLE LEFT ON CCAA’S LOT AFTER THE MONDAY FOLLOWING THE SALE. Don't miss a deal just because you miss the auction ... bid online! View live streaming video and audio of auction lanes! Convenience and comfort of buying from your office! Photos and Condition Reports are provided for lease and repo units! 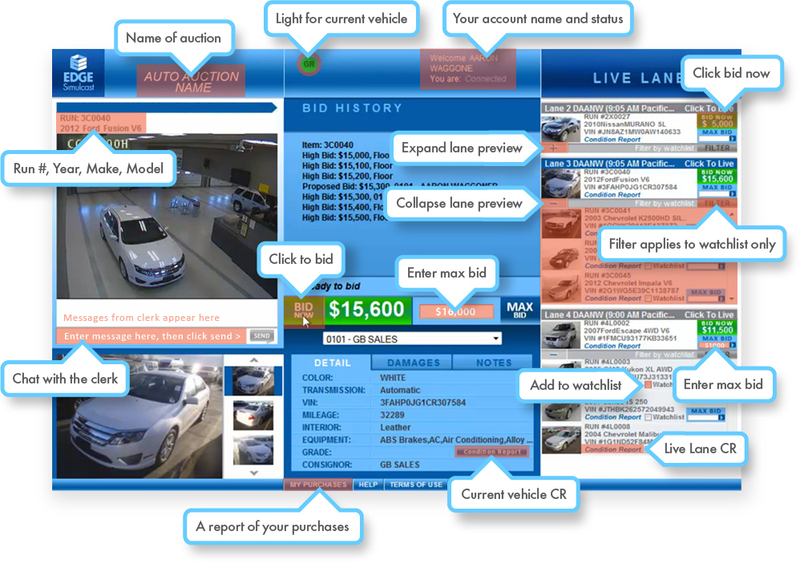 Set proxy bids to ensure you get the vehicle you want at the price you want! Personalized customer service, including vehicle walk-arounds and vehicle searches based on your specifications! Powered by leading online auction software company AuctionEdge! Have peace of mind! Every vehicle that is sold Green Light comes with a mandatory Post Sale Inspection. Because you can't be here to "kick the tires" yourself, this ensures that the vehicle your purchase is as it was represented, with no major frame or mechanical failings. This $99.00 fee is automatically charged to your bill of sale. Bid early, bid often! There is occasionally a fraction of a second delay between when you place your bid and when the auctioneer sees it. Therefore, don't wait to try to "sneak your bid" in at the last second, as the auctioneer may accidentally miss it. If he sees you bidding early on a vehicle, however, he'll typically wait to give you additional time to bid later on in the sale, expecting future bids. Know your fees! In addition to the $99.00 Post Sale Inspection fee for every Green Light vehicle, there is also $75.00 internet fee applied to each vehicle sold online. Post Sale Inspections are valid for 7 days or vehicle being driven less than 200 miles from sale date. Understand the process! In extremely rare instances, due to the delay between the auctioneer closing the sale and the internet clerk clicking the "Sold" button online, an internet bid can slip in. Although this bid will show up on your computer screen as valid (because it occurred before the internet clerk closed the sale online), it is, in fact, not recognized by the auction as a valid bid because it occurred after the auctioneer declared the vehicle as sold. NO Post Sale Inspections on Diesel Vehicles (Even if unit is Green Light). Copyright © Capital City Auto Auction. All rights reserved. All trademarks property of their owners.